Vossloh is a world-leading specialist in the design and manufacture of switches for all urban and interurban guided transport systems. Our teams design and build complete solutions for trams, whatever the technique or rail profile. For maximum comfort, safety, and reliability, we have developed monobloc switches that are machined in the mass, thereby optimizing the total cost of ownership of switches (LCC: Life Cycle Cost). Thanks to multiple areas of competence and experience, Vossloh has made a major contribution to the development of modern tram systems. We produce all types of turnouts using flat bottom rails or grooved rails: connection turnouts, diamond crossings, single or crossed scissors crossovers, double junctions, combs, adjustment switches, californian turnouts and others, in accordance with the various tangents and usual radii. Our turnouts adapt perfectly to specific geometrical constraints, permitting tramway traffic movements in optimum conditions of safety and comfort for passengers. They also take account of environmental constraints in order to reduce the noise levels to a minimum to protect the well-being of residents. 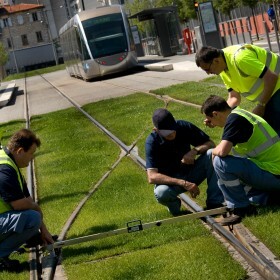 The range of turnouts for tramways from Vossloh very significantly reduces costs related to laying and maintenance works.